Precooked scrambled eggs with flavorful bacon. A classic morning meal. Easy to prepare, good source of protein and very filling. The perfect choice for emergency food storage. No cooking required. Just add hot water, wait a few minutes, and they are ready to eat. Eat the whole can or just what you want. Seal the can with the included plastic lid. 2. Bring 1 cup water to a boil. 4. Add ¾ cup dry mix. 5. Stir gently to wet all ingredients. 6. Cover. Let stand 5 to 10 minutes. 7. Drain excess water and serve. Add 8 cups (64 oz) boiling water to contents of can. Follow steps 5 through 7 above. 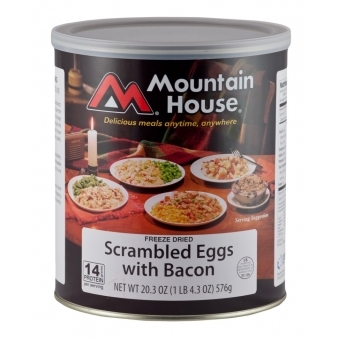 It is necessary to store Mountain House products properly to ensure maximum shelf life. Store the product in a cool area, avoid long-term storage above 72 degrees F, and be careful to not puncture the cans. Under these conditions, Mountain House meals will maintain its shelf life for product quality flavor and nutritional value. Once open, contents should be used immediately. However, product resealed using plastic recloseable lid has been found to be acceptable up to one week after opening. This package is sold by weight, not volume. Some settling may have occurred due to shipping, handling or variations in the product density.